The dazzling hue of a tanzanite stone is the perfect fit for your bride-to-be. 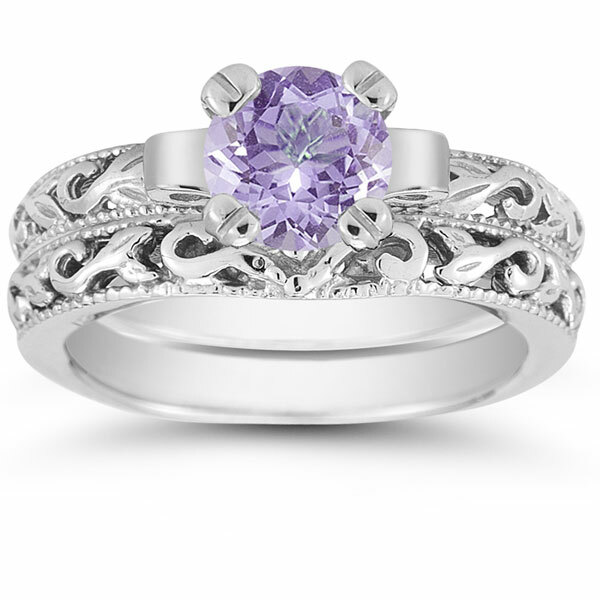 In this Apples of Gold bridal ring set, purple reigns supreme with its luminous color and sparkling appeal. The 6mm tanzanite gemstone is perfectly poised in a setting of 14K white gold that echoes the fashion of art deco. 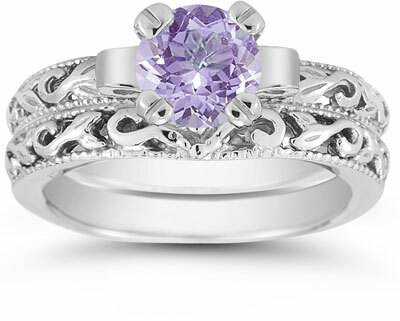 Two bands of the same high quality white gold are crafted to perfection with milgrain edging and special art deco pattern that makes this tanzanite bridal set just right. We guarantee our 1 Carat Tanzanite Art Deco Bridal Ring Set, 14K White Gold to be high quality, authentic jewelry, as described above.